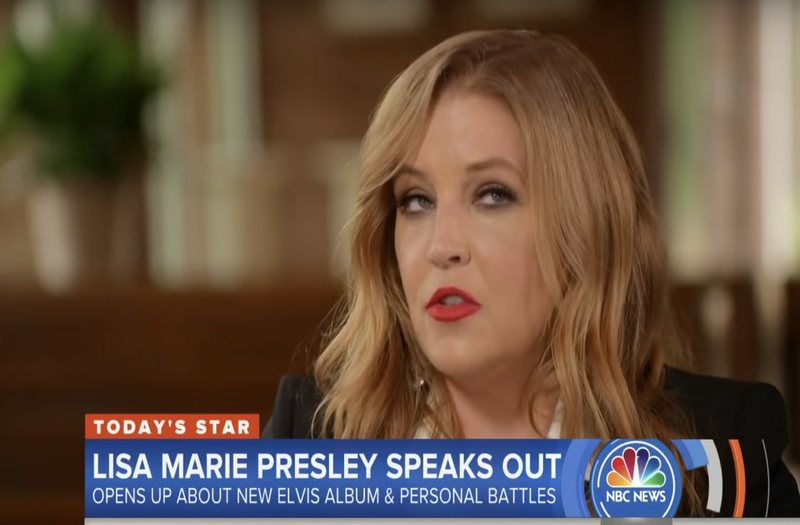 In her first TV interview in four years, Lisa Marie Presley told the Today show’s Jenna Bush Hager about her fight with drug addiction. Earlier this year, the singer’s problems were exposed following a messy divorce from Michael Lockwood. And at the worst of her addiction, Presley’s life was in jeopardy. Presley has been caught in a whirlwind of headlines over the past year, from her divorce to several legal battles over moneyissues. “I’m not perfect. My father wasn’t perfect. No one’s perfect,” she said. But on the positive side, the singer recently co-produced and sang on a new Elvis album called Where No One Stands Alone, which features his take on gospel songs. That album is out today. (Original Caption) Las Vegas, Nev..Entertainer, Elvis Presley sits cheek to cheek wit his bride, the former Priscilla Ann Beaulieu, following their wedding May 1, 1967. Elvis Presley and his wife, Priscilla, prepare to leave the hospital with their new daughter, Lisa Marie. Memphis, Tennessee, February 5, 1968.